Live streaming allows people to broadcast their own life or experiences online in real time to friends, followers or the general public. Many apps and social networks including YouTube, Facebook and Instagram now allow users to broadcast live directly from their smartphones. Whether it’s watching their favourite celebrity or broadcasting their own lives, Live streaming is becoming a big part of young people’s lives online. Live streaming apps are a great way for users to share real time experiences from events, concerts, games and festivals. For many young people live streaming also allows them to find out more about and interact with their favourite celebrity or musician. Live streaming is a popular tool used by news and media organisations to broadcast breaking news and live events. Familiarise yourself with the live stream platform before getting started and decide what settings are best for you. Many live streaming apps allow you to switch off comments, delete videos after a live stream and update your location settings. 2. Who will see your broadcast? Consider your audience before starting a live stream. We recommend using a friends-only setting to ensure you know who is watching. 3. What information are you sharing? 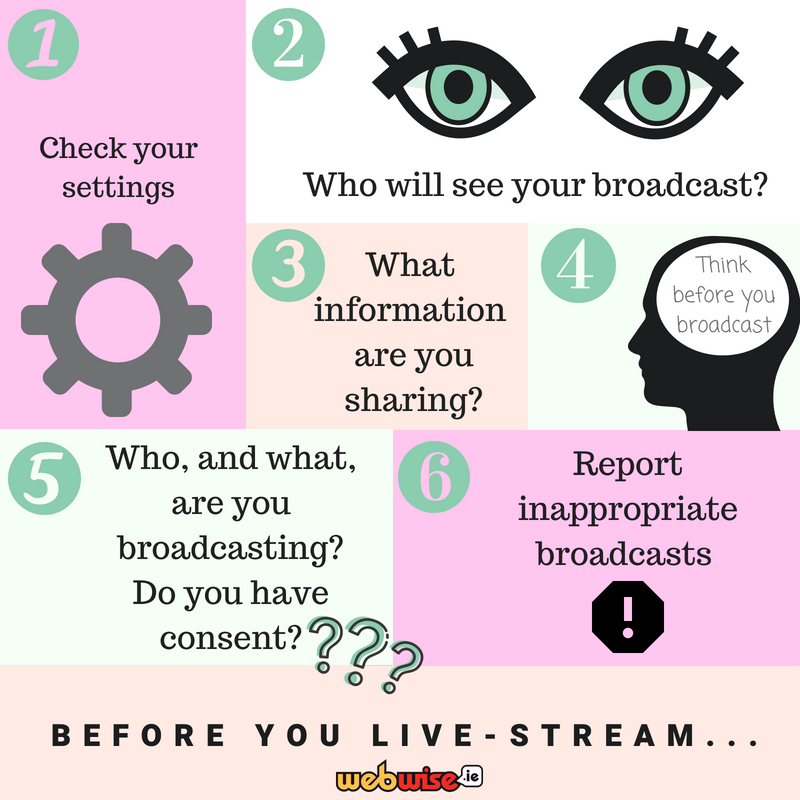 Consider what information you are share during the live stream, for example, is your location available or are you giving away any personal information during the broadcast? It can be very easy for someone to record a live broadcast without you knowing. Users should also remember that while they can delete a video once it is broadcast they cannot remove what has been viewed during the live broadcast. 5. Who and what are you broadcasting? There a few things to consider before broadcasting… who is in the broadcast? Do I have their permission to film? Will anyone be offended by my broadcast? Will my broadcast affect anyone? If you see something that makes you uncomfortable you can report it to the social network through the reporting tool. Users should also report any abusive comments they encounter and block the sender.